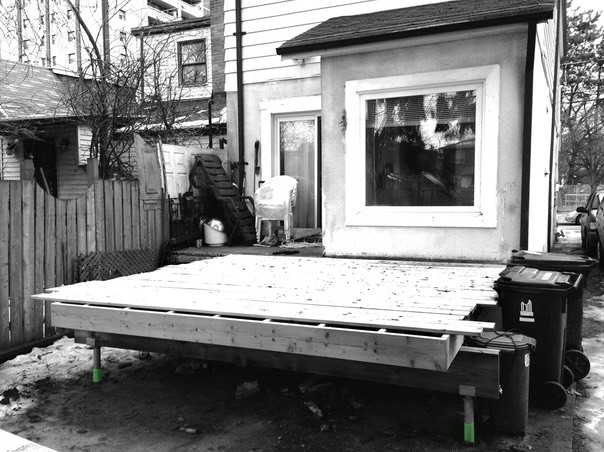 Toronto buildings threatens new homeowner with court action over an illegal deck. | ERICKSONG ARCHITECTS INC.Gary Erickson Architect | ERICKSONG ARCHITECTS INC. The OMB trumps city by-laws. Dec 9, 2010. 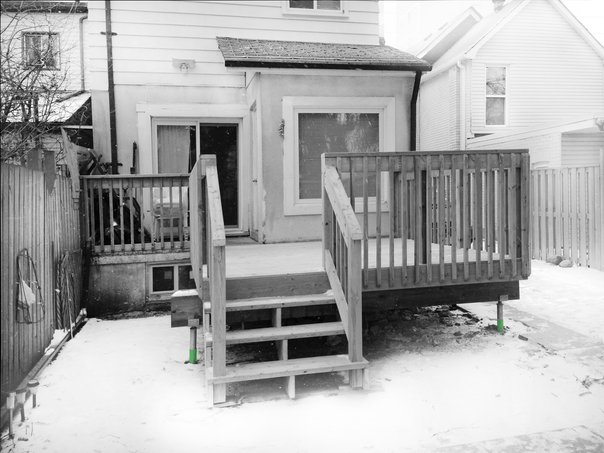 Toronto buildings threatens new homeowner with court action over an illegal deck. Review - "Family appeals again to save reno." Chinese family claims human rights violated by Toronto zoning bylaw. I got a call from Eliza, a nice young mother in her new home. 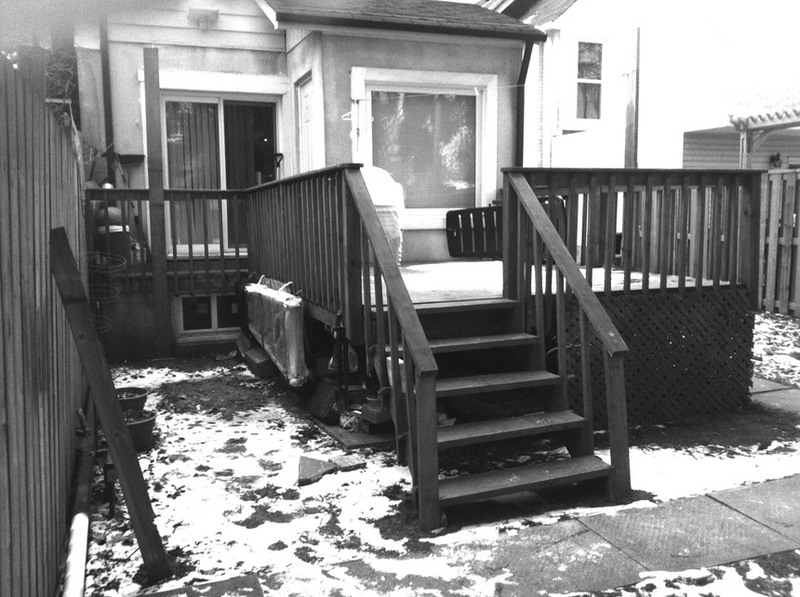 She was being aggressively sued by the city of Toronto for having an illegal deck on the back of her newly aquired house. A REALTOR� has an obligation to discover facts pertaining to a property which a prudent REALTOR� would discover in order to avoid error or misrepresentation." When buying a house please check the city record of building permits at the city building permit desk. �If there is a permit missing, you should be able to negotiate down the price to accomodate what you will have to do to comply, or risk Eliza's permit trouble.�Realtors would be wise to examine the permit status of their properties before sale, and warn buyers of�deficiencies. Under the pressure of a sale of�property, the back deck often goes unnoticed. One pretty winter day I biked up to the Danforth on a Sunday, locking the bike to a snowy handrail. �The living room was warm and modern in the restored home. Grandma gave me tea and a funny bread snack. Dad was concerned. The baby cried in the background. Mom hovered. Who could say no? Its not their flault the city can't see who is violating the building laws. So the same blunt instrument is taken to all, guilty or innocent. The additional stress on a mother already busy with a baby was not what the inspector intended. The inspector was right of course, the deck was very poorly done. Almost everything was wrong in some small way. The thing protuded one foot too far into the backyard. Chop it, zoning said. The space between pickets is too wide. The guard is to low. The foundations are the wrong type. The handrail may collapse. Fix it said the bulding inspector. Deck construction may look innocent enough, but it may be the most potentially dangerous part of the house. An exposed wood construction, held together by nails alone, can't hope to long survive Canadian winters, and the combined loading of wind and people. In a few years, as the nails pull out, the deck may suddenly collapse, and if not kill, injure frail grandma or baby. The USA has a youtube campaign to spread the warning of the dangers of poorly built decks. 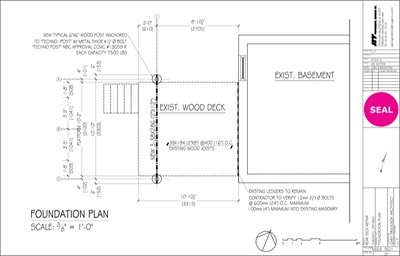 Homes on Homes has recently rebuilt a similar disaster deck in episode 7080, Hit the deck. Bits of wood can be added to bring handrails and balustrades up to code strength and safety. And rotted wood should be replaced with pressure treated wood. Often starting over may be cheaper than fixing the deck. Your deck contractor would be the best person to ask about that. It depends on the extent of code violations. 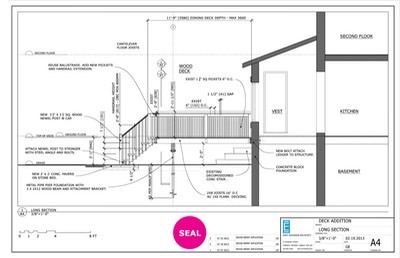 As an idea of the amount of professional work required to fix the deck, Eliza has kindly allowed me to show you her permit drawings, both architectural and structural. The property address has been removed to protect the privacy of the family. The idea of using university educated and qualified professional architects and engineers to fix a small cheap wood backyard structure is absurd. Additionally, a host of legal and government staff have to be employed to manage this detail, and ensure its safety and compliance. Our property tax goes up and up. The beauty of Title Insurance. Does your real estate agent carry it? It's true, title insurance can pay most of the costs of the deck permit and rebuild. Legal fees seem to be the exception. �All together it wiil be over $12,000 paid out. That is a lot of baby formula. Indeed the young family might go to Disney World for weeks for that. Seems a shame, after all that cost, not much will improve, except for the code compliance of the deck. The real saftey and durability may be negligible depending on the infractions. The amount paid has to do with the contractors quote on the drawings. That means they have to be pretty exact, as contractors tend to price only what is drawn. Tip: don't shirk on the architects fees. Thats a lot of drawings, even for a little deck. Every peice of wood has to be drawn. Extras during construction aren't covered by insurance. Too late! To get your claim money, you will sign off on a letter to limit your claim on the quote. Of course. Techno Metal Posts installed. It drills seven feet down into the frozen soil. The general contractor can sometimes work a new deck for the same price as a refurbished one. Although keeping the deck was necessary for the title insurance process, the refurbished deck was irrational considering constructability and longevity. �The owner and contractor decided to translate the rehab budget into all new construction. The old deck was demolished. The old concrete "feet" foundations and buried stair are still to be removed. Ernie Leung P. Eng of JIT engineering recommended a small diameter drilled metal pile called a "Techno Metal Post", favored by the city and at a fraction of the price of concrete foundations. Sylvain Nadeau, the Techno Toronto franchise owner, explains that this metal post drilling technology is taking over the small to medium size concrete pier market in Toronto. This company in particular has small scale drilling machines using pneumatic drilling technology that can make it into very small residential sites, and for much lower price points. Contractors like the clean, fast, reliable and controlled approach. Shown is Sylvain and his Techno Post drilling machine, along with the installation shot after placement. The green sleeve is cut back close to grade. It protects aganst some soil movement. The galvanized bracket on top to support the 3 2x12's are yet to come. The cost can run from a $1200 flat fee, with a unit price of $300 to $700 for the deck size installation, placed on a 8 to 10 foot structural grid. With some drilling of the first layer of soil to break up frozen ground, the 5'6" foot deep posts were done in 2 hours, much faster and safer in the winter than concrete pile foundations down only 4 feet. A nearby tree was not affected by the small, 1 foot diameter screw head of the pile. To damage a tree is a $100,000 fine in Toronto, if protected. Thats right, 100K! The deck type Techno Metal Post comes with a 4600 lbs loading rating and a 5 year warranty. Up to 50,000 lbs load ratings are available. Finally work starts, but is stalled due to rain. The deck floats on a cross beam of 3 2x12's. The GC hired a specialist to do the wood deck construction, with a thousand decks under their belt. Inside the house, a big neighbourhood party for Eliza's one year old girl is on, complete with disney treats. She insisted I have a peice of birthday cake and some tea. I complied. 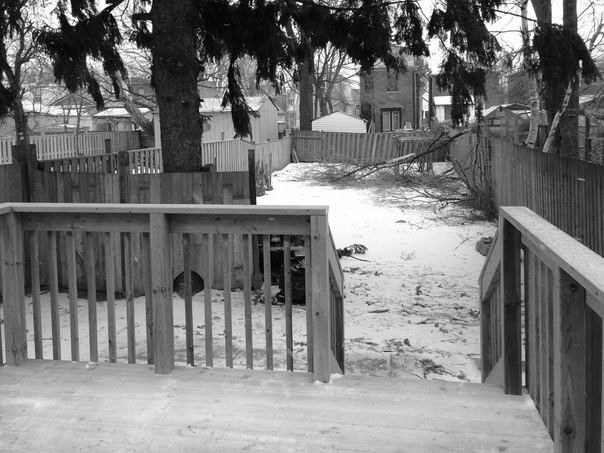 Almost complete, legal, safe and warm, the deck is rising out of the snow. The landscape has to wait till the spring thaw. Looking back to the deep backyard. Trees have fallen due to the 2013 ice storm. And that's another story.